All Iwata Medea airbrushes use O-ring sealed fittings which form leak-proof seals when attached to the airbrush. The braided nylon-covered PVC airhose is a proven and dependable airhose. Made with premium-grade PVC material, this airhose is covered with a durable, tightly woven nylon cover. The straight shot and coiled airhoses are made of polyurethane, which is ⅓ the weight and twice the strength of traditional vinyl airhose. 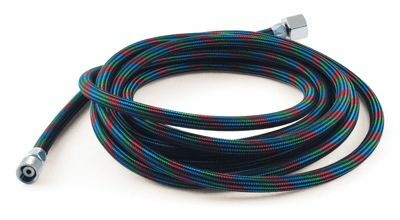 The coiled airhoses are unique in their design because they recoil out of the way when not in use. The versatile airhose adaptors allow conversion of most other manufacturers’ airbrush hoses to be used with Iwata airbrushes.